April 4th, 2017 | Moving Tips, Packing Tips. Traveling in inclement weather comes with a number of challenges, from safely navigating slick roads to calculating an arrival time based on weather conditions. Moving all your possessions in the rain or snow can be even more complex, especially if both your current hometown and your destination are experiencing storms. If your local weather forecast predicts precipitation on the day of your move, your first step to make the process safer and smoother is to pack as if every item will get wet. With this method, you don’t have to worry about water damage if a container does actually come in contact with moisture. In this blog, we list six tips to help you waterproof your belongings. If you’re expecting torrential rains or nonstop snowfall on moving day, consider hiring a local packing service instead of trying to prepare all your possessions yourself. A reputable company with experience in the area will have the packing materials necessary to keep your items safe and dry on hand so you don’t have to do as much pre-move shopping. A professional packing service can also help you avoid pitfalls you may not have anticipated. When moving in dry weather, you may decide to leave your larger furnishings uncovered. In wet conditions, however, all of your furnishings need protection. 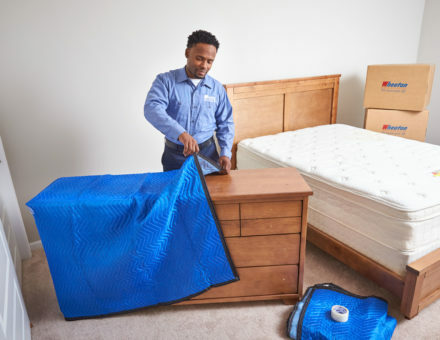 It’s obvious that you’ll want a plastic cover for your mattress and favorite upholstered chair, but wood and other hard materials are also vulnerable to water damage. Moisture can warp these materials permanently, causing bowing or expansion. Disassemble your furnishings and cover each piece individually. If you can’t find a tailor-made cover for each item, create your own using a tarp or plastic drop cloth. Because items need to be carried to the truck and loaded up by people, there’s a high possibility of water or snow being tracked onto the truck bed during the process. As you go through your boxes and label them “heavy” or “fragile,” also include a label for items that absolutely cannot get wet. “Keep dry” or “don’t get wet” both serve this purpose. You’ll want these items packed on top of other items but away from the exterior walls if possible to avoid any water on the floor and any condensation on the sides of the truck. If you do need to use less-than-waterproof containers for any items, line these boxes to minimize any water intrusion. Use a drop cloth or heavy duty garbage bag as your lining. Put the plastic into the box so that it covers the bottom. Fill the box up with items and fold the sides of the plastic over the contents. Finish the lining process by folding the edges of the plastic together and taping them down with packing tape. If lining doesn’t work for one of your boxes, place smaller items in sealed plastic baggies, package medium-sized belongings with garbage bags, and wrap large items with plastic drop cloths. As mentioned in section three, moisture can appear in many places during a rainy or snowy move. As you pack, think about situations where water could pose a risk to your belongings other than when the boxes are going to or from the truck. Collect tarps, drop cloths, or moving blankets so you can cover the bed of the truck, the floors of your home, or the tops of certain items to provide more water protection. As you pack, assess the structural integrity and waterproof nature of each container. You can reinforce boxes that might bend or break by layering packing tape around the corners. You can make all your containers, including plastic tubs, more waterproof by covering any openings with plastic and taping it securely. For this purpose, you can use lightweight plastics like garbage or grocery bags rather than the more heavy duty plastics recommended for other tasks. For expert advice and more information, contact us at Wheaton World Wide Moving. It is very important to protect the electric appliances in rain. Wrap appliances and electronic equipment and wait until the rain stops to transport them or make sure they are well covered and away from water during the shift. Thanks for sharing your ideas!